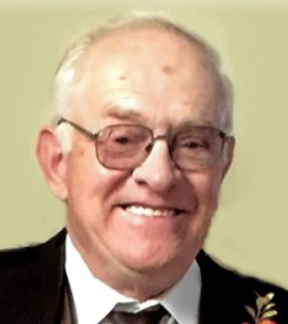 John Marthaler, age 86 of Osakis, went to meet his Lord on Monday, March 11, 2019, from the Windmill Ponds in Alexandria. John Anton Marthaler, Jr. was born on Sept. 28, 1932, in Osakis. His parents were John and Marcella (Beste) Marthaler and he was one of five children born to this union. He grew up learning the demands and hard work of life on a farm. As a young boy he helped with chores, planting and harvest and quickly learned to love the life of a farmer. He would spend all of his life managing dairy herds and crop farming just south of Osakis. He married Dorothy Reber on June 14, 1962, in St. Joseph and they had seven children. Dorothy passed away in 1984, leaving John with a young family and a busy farm to run. John later married Carol Marthaler on Valentine’s Day, Feb. 14, 1986 in Osakis. He was a member of the Immaculate Conception Catholic Church in Osakis. He belonged to the Knights of Columbus St. Michael’s Council #3176, and proudly served as a 4th Degree Knight. He also served on the church Parish Council. While farming, John served for many years on the Osakis Creamery Board. He semi-retired in 1996, when they moved off of the farm to a home near the farm on the edge of town. John actively farmed as long as he could, and even helped with the combining as recently as last fall. He was a John Deere devotee and he loved giving rides in his side-by-side four-wheeler. He would work in his shop during the winter months, making and repairing his own tools and doing woodwork projects. He made furniture, birdhouses, beautiful rocking chairs and toys for the grandkids. In the summertime he would plant a garden and was known for his lettuce and radishes. He kept a beautiful lawn and planted many apple trees over the years. John loved old time and country music and could play the accordion. He liked to watch television with his Chihuahua, Minnie, lying peacefully on his lap. His family meant everything to him and he was a proud father, grandpa and great-grandpa. He enjoyed boxing in his earlier years, going snowmobiling, dancing and socializing with many friends. After 24 years wintering in Texas, John will be missed by his southern neighbors as well. He was a kind-hearted and generous man who leaves a legacy of love. Blessed be his memory. He is survived by his wife, Carol Marthaler of Osakis; his children, Karen (Butch) Von Wahlde of Sauk Centre, Pat (Patty) Marthaler of Osakis, Linda (Mike Schulz) Uhlenkamp of West Union, Janet (Jay) Neu Ramos of St. Cloud, Ken (Tiffany Esterberg) Marthaler of Osakis, Colleen (Wade Dalton) Miller of Long Prairie, Dennis (Tina Brekken) Marthaler of Alexandria; step-children, Keith (Sue Cook) Marthaler of Sartell, Lisa (Mike) Hynes of Brandon, Shelly Marthaler of Sartell, Scott (Kim Stasch)Marthaler of Cold Spring, CJ Marthaler of Minnetonka; 25 grandchildren; three great-grandchildren; siblings, Gerald ‘Jerry’ Marthaler of Osakis, Lois Marek of Albuquerque, N.M., Gladys Leonardi of Wheat Ridge, Colo.; many nieces and nephews. He is preceded by his parents, wife, Dorothy, two grandsons, Caden Miller and Greg Marthaler; son-in-law, Steve Neu and an infant brother. A Mass of Resurrection was held for John on Friday, March 15, 2019, at 10:30 a.m. at the Immaculate Conception Church in Osakis with Fr. Greg Paffel officiating and Homilist was Fr. Andrew Marthaler. Cross and Scripture bearers were Brock Marthaler and Emma Miller. Lectors were Dan Marek, Merissa Durbin and Taysha Marthaler. Eucharistic minister was Alcuin Marthaler. Giftbearers were Brianna VonWahlde, Shayla Marthaler, Carley Nelson and Tiana Krueger. Song leader was Todd Johnson and soloist was Jay Ramos. Interment was at the Calvary Cemetery in Osakis with active pallbearers, Brandon Von Wahlde, Nolan Marthaler, Josh, Derek and Ethan Uhlenkamp, Logan Neu and Zach and Bailey Marthaler. Honorary pallbearers were Keith Marthaler, Sue Cook, Lisa and Mike Hynes, Shelly Marthaler, Scott Marthaler, Kim Stasch, CJ Marthaler, Debra Vigil, Bobby and Steph Brekken, Jay Brekken, Brandon Durbin, Devon Nelson, Wade Krueger, Austin and Connor Ramos, Amanda Marthaler, Madison Barrett, Kristine and Jeremiah Bettermann, Taelin Marthaler. Arrangements by Roy-Hetland Funeral Home, Osakis. www.royhetland.com.